I interviewed Helen over the phone in 2017. She was living in San Clemente. This is what she had to tell me. Helen Webb at a library staff party, paid for with funds left to the staff by Diane Erdelyi. 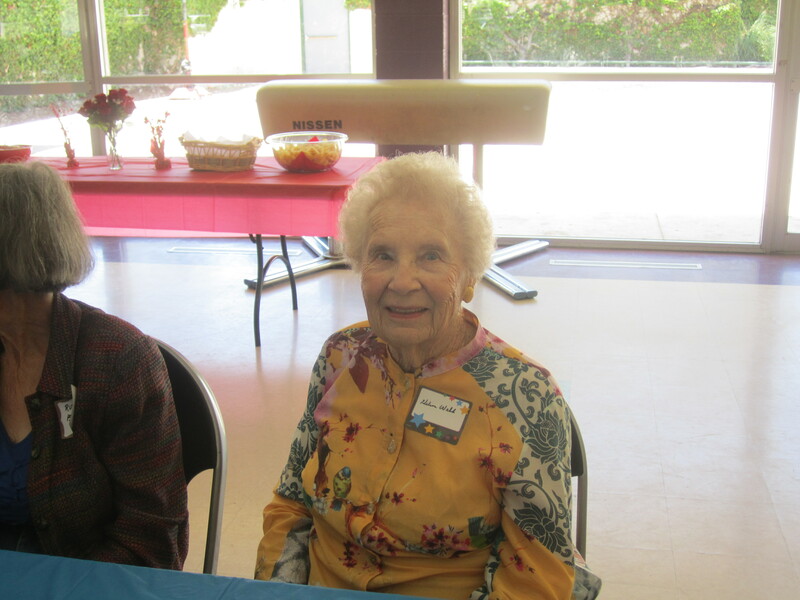 Helen Webb was born in 1919 in Oklahoma and moved to California in 1940 when her husband got a job in one of the war industries in Long Beach. Helen went to work at the Firestone Tire Company but in 1959 decided to take the library page test along with her son Ralph. Both were hired. Ralph went on to work at Bret Harte. Inspired by the librarians around him, he decided to become a librarian, earning his library degree in 1962. He later worked as a librarian for the Peace Corps in Venezuela. Upon returning to the United States, he followed Connie Johnson, who worked at North, to Palos Verdes Public Library. Helen was soon promoted to Library Clerk. She first worked at Main, then went to North as head clerk and later became page supervisor under Jean Covall. Gracia Clark also worked with her. Helen remembered that Gracia asked that she be given Saturdays off, and switched her day off, Monday, with Helen. Gracia later changed her mind, but Helen wouldn’t switch back. Helen was great pals with Trudy Mullen, the staff artist (who died at age 102), and Dorothy DeWeiss in Reserves. Helen remembered notes left at the library in the late 1960s stating that the library was going to be bombed. Helen remembered the Fire Department coming through with their long hoses, looking for the bomb. Helen recalled that North Library used to be called “Northeria” (like Siberia) because no one wanted to work there under Violet Fell. Beulah Nelson also worked as a librarian at North as a part time librarian, she married for the first time at age 70. Helen couldn’t forget Leslie Swadling who worked as a librarian in Literature and History. An Australian by birth he worked as an actor in England, and remembered being in Germany during Hitler’s reign. He was very popular with everyone because of his personality. He also liked to body surf.